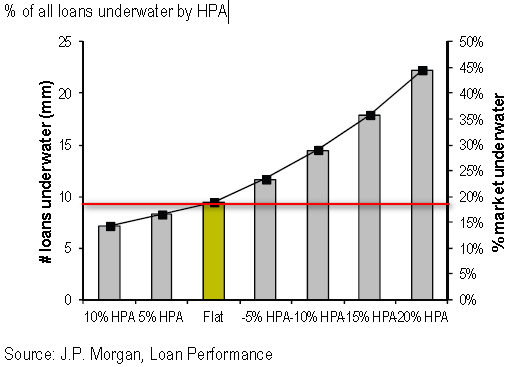 As we finally begin to see improvements in the US housing market (see discussion), it is important to note that we still have roughly 9 million mortgages that are "underwater" (the mortgage balance is higher than the value of the home). That's almost one fifth of the overall market. Furthermore if home prices for some reason begin to decline again, that number of underwater mortgages increases quickly. The chart below from JPMorgan shows the impact of increases or declines (in 5% increments) in home prices ("house price appreciation" or HPA). The housing recovery has a long way to go and substantial downside risks remain.